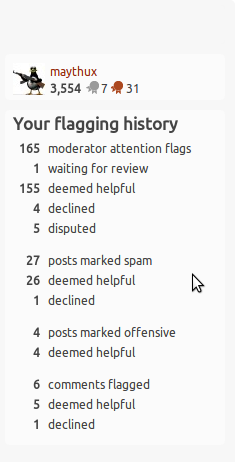 How do I show another user my flag history? aditya patil asked for my flag history in my nomination discussion here. How can I provide my flagging history? I think you could print screen your flag history from your profile and that's enough. I don't know if there is another way to do that. Your flag history is private. You only (any maybe mods, not sure) can view it but other users can't. I can't see yours; you can't see mine. Thus, the best way to share your flag stats is via a screenshot or just copying the text.